I know my Lady loves us all, just like other pet parents love their furbabies. A lot of times they get us furbabies when we’re young energetic pups or kittens. Then, without anyone realizin’ it, we start packin’ on the pounds. That excess baggage can make ya awfully tired, suckin’ the energy right out of ya. Then, fido or fluffy would rather hang out on the couch than go for a walk or even play fetch with ya! To many pounds and you can’t keep up runnin’, wrestlin’ and playin’ chase either! I’m gonna let my Lady talk a bit and tell ya a special story! Molly is right in that sometimes the weight gain sneaks up on you. Just like with humans, one day everything is fine and then months down the road you realize the pounds are adding up! But how do you resist those pitiful begging eyes? I know I feel like the bad guy when I don’t give in. Anyone else? Then, if you put them on a diet by cutting back on the amount of food you feed them, you feel like a total schmuck when they beg for more! That’s why I am loving the Hills® Prescription Diet® Metabolic Advanced Weight Solution! With this diet, you change what you feed your pet, rather than how (or how much) you feed. The Hill’s Prescription Diet Metabolic Advanced Weight Solution is available for both dogs and cats. It also comes in both dry and canned. Oh, and they even have treats! You heard right! Your pets will enjoy the fact that even overweight dogs and cats can still have treats! We wanted to show you this very special story of Bear. His family was all out of options for dog weight loss and it seemed almost hopeless. 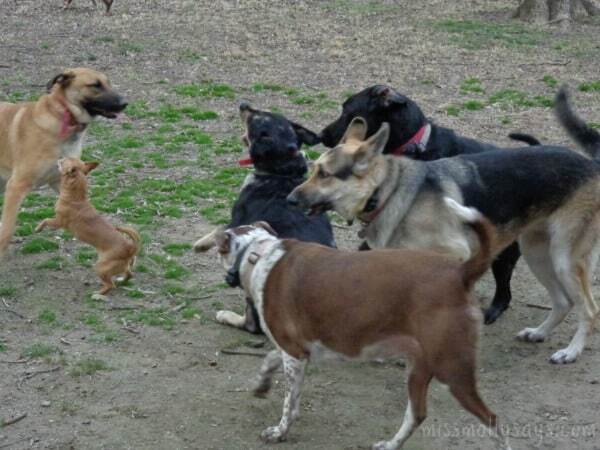 Then, upon the recommendation of their vet, they tried the Hill’s® Prescription Diet® Metabolic Advanced Weight Solution. Please take a moment and watch this special and inspiring story! If you can’t view the video, you can view it at Pet Weight Loss Success: Bear’s Story. Tear jerker and heart warmer at the same time huh? While Bear got his mobility and energy back, it’s the quote of the Dad that says it all. Bear’s Dad says simply, “I gained a friend”! The Metabolic Diet worked for Bear because he was still able to eat a full portion, plus have treats. Instead of cutting back on his food, it changed his metabolism. While eating Metabolic Advanced Weight Solution, an overweight animal’s metabolism changes to act more like that of a lean animal. Even after weight loss is achieved, the highly efficient energy metabolism profile is maintained. 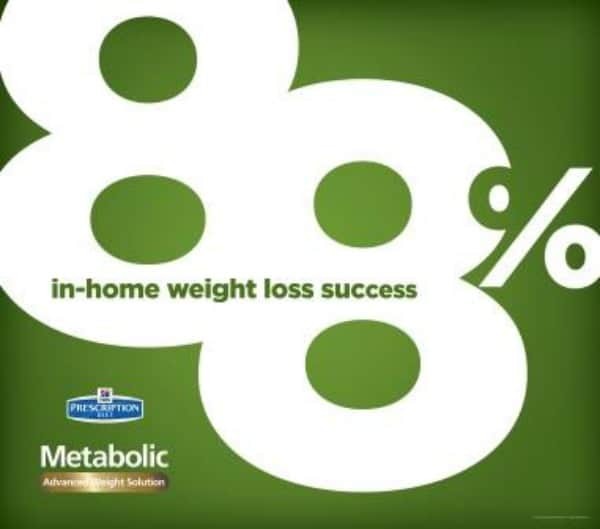 Hill’s® Prescription Diet® Metabolic Advanced Weight Solution provides clinically proven nutrition that naturally activates metabolism to burn calories and regulate appetite. Your pet’s quality of life and relationship with your family is impacted because that extra weight can reduce play time, impact mobility and affect the lifelong general health of your pet. Dogs and cats everywhere are losing the pudge, firming up and gaining energy. They are ready to play and conquer the world! Check out Gracie and Norman below! They say a picture is worth a 1000 words. These certainly are! This is Gracie, who was surrendered at the shelter. She is a spayed female, age unknown. Gracie lost from 78 lbs to 45 lbs in 180 days. That’s 19.7% of her body weight lost over 17 weeks! Today, Gracie is happy and smiling and has found a forever home. Wow! Doesn’t she look wonderful?! This is Norman. He’s a neutered male, domestic short hair. Norman lost from 14.4 lbs to 11.4 lbs in 150 days. While that doesn’t seem like a lot, it’s 19.8% of his body weight lost! Norman’s vet says Norman is “more energetic, looks and seems to feel great. What a transformation”. So, now I would like to ask if your pet could stand to lose a few pounds? If so, I highly encourage you to speak with your veterinarian about Hill’s Prescription Diet Metabolic Weight Solution. It just might be their answer to losing the pudge and gaining your energetic playful friend back! wow that’s fabulous how much it helped both Bear and Gracie. It’s important for all of us to be healthy and now we can help our pets too. thanks for sharing! I would love to try Hills® Prescription Diet® Metabolic Advanced Weight Solution for my older dog who spends much of his days lying around and not doing more than just eating and barking at the cat once in a while. He loves his treats and I love that they have treats in this formula! I loved Bear, Gracie and Norman’s stories! I will have to see if I can get this as our cat Daisy is on the “Extra Large” side.